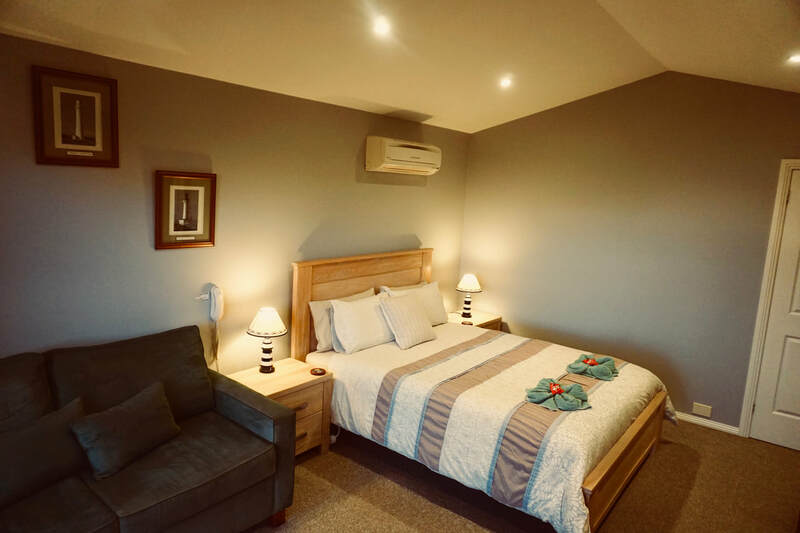 The Harbour suite is perfect for the weary traveller and visitor to the Great Ocean Road, Otways, Twelve Apostles or Great Ocean Walk. A comfortable and luxurious room ensures your stay is memorable and enjoyable. 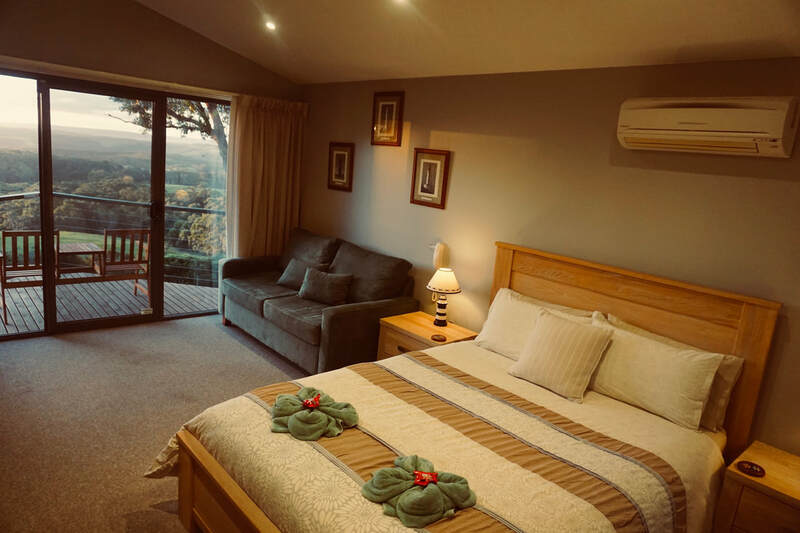 Then there's the views- the sunsets, coastal and valley views, and sandstone cliff faces of the Twelve Apostles will be sure to delight and leave a lifelong memory. For your comfort we have provided ample bedding, electric blankets, reverse cycle heating/cooling and all the mod cons needed to ensure a fantastic stay. 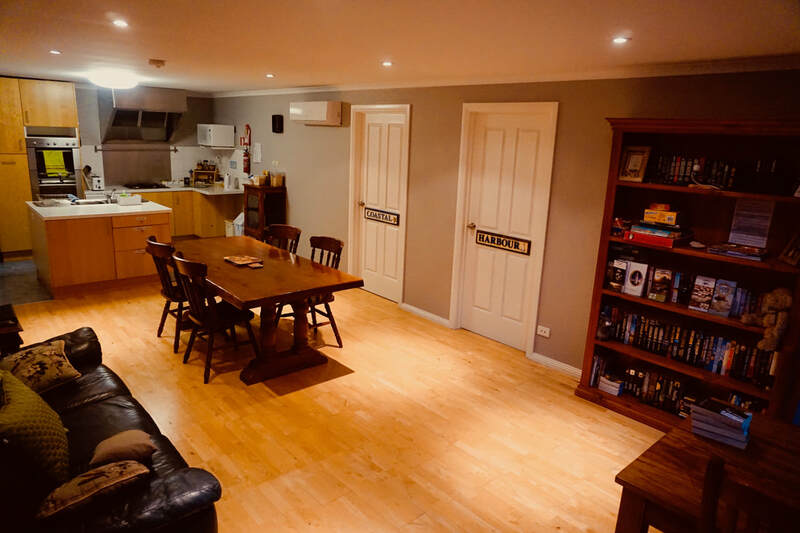 The shared kitchen lounge (as seen at bottom) is a fantastic opportunity to cook an evening meal and don't forget a continental breaky and tea/coffee is provided free with the room. No wonder theses rooms are so popular. If you're after an extended stay and more luxury please consider our cottages- they're amazing! Newly renovated and very cosy, our Harbour suite has all you need- warmth, comfort and beauty. With its own ensuite, deck and personality- you'll love the decor of our Harbour Suite. 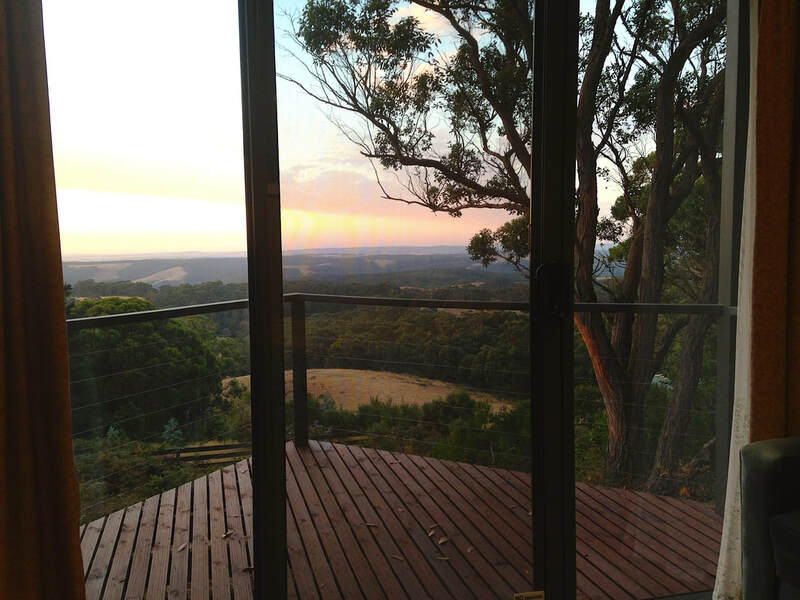 The room, the deck, the view... relax and unwind and savour the beauty of the Australian bush and its remarkable wildlife. 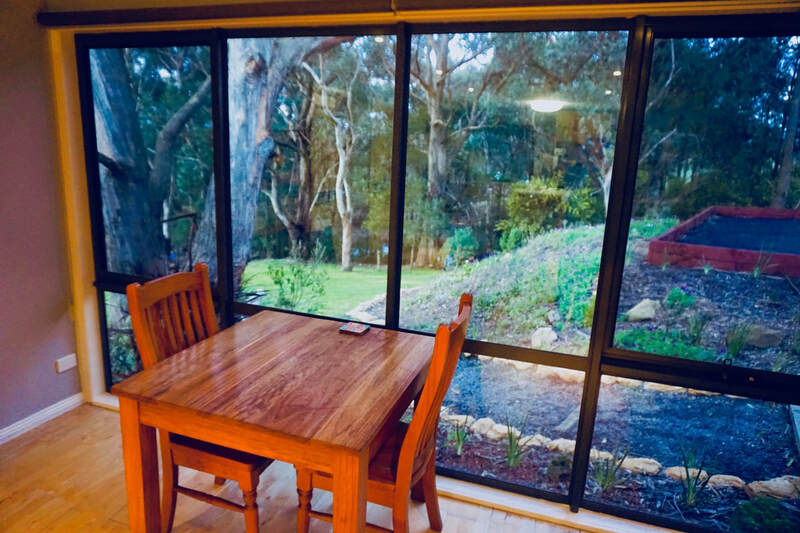 Enjoy the tranquil bush setting while taking in the views from the 12 Apostles coastline through to our Otways bushland. Spectacular valley and coastal views from your deck and room await you from our Harbour Suite. At different times of the year you'll view kangaroos, echidnas, eagles, gang gang cockatoos- just to name a few. The views are amazing from the deck of Harbour as the westerly facing deck boasts coastal & bush views, with the sandstone cliffs of the Apostles in the distance. The Harbour Suite boasts excellent comfort and all the mod cons needed for a memorable stay. An ensuite is attached to the room and is not shared. Great views, ample personal space and all the comforts you need for a relaxing stay. Room includes heating/cooling, electric blankets and comfy bedding. 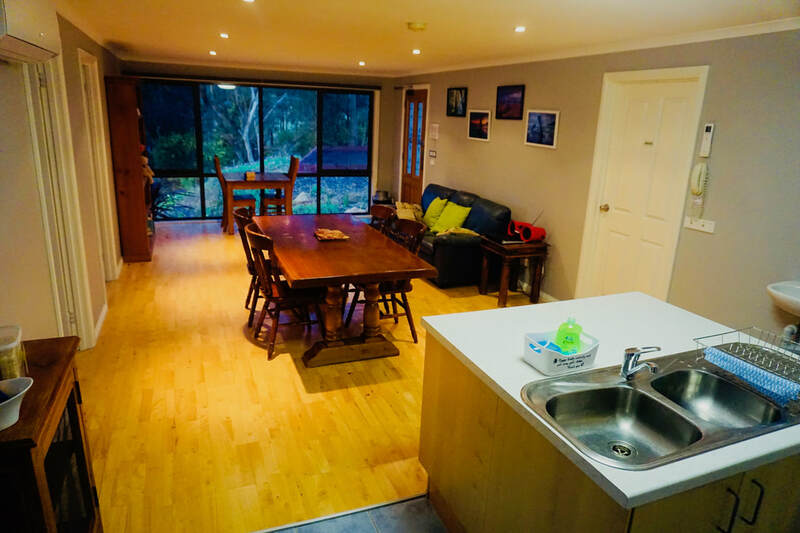 The cosy commercial kitchen/lounge includes a bookshelf with great reading and board games and ensures your stay is enjoyable and complete. All it's missing is you! The commercial kitchen is fantastic for cooking up a meal with all the utensils you need provided. A complimentary continental breaky completes your stay. A peaceful and tranquil bush setting is viewed from the room. Kookaburras, kangaroos, gang gang cockatoos are just a few of our visitors and the bush scenery is spectacular!